The constellation of signs and symptoms listed in Group D of Table 1 are known collectively as the “cauda equina syndrome”. The distinguishing feature of this syndrome is the involvement of the sacral roots below the S-1 level. These symptoms distinguish the cauda equina syndrome from acute benign lower back pain (Group A), acute lower back pain with radicular symptoms (Group C) and the lower back pain which is not primarily spinal in origin (Group B). In the early reports on disc operations this, most severe of the disc hernia syndromes, was represented by a disproportionate number of case. Seven of Mixter and Barr’s original cases had a variation of this syndrome. 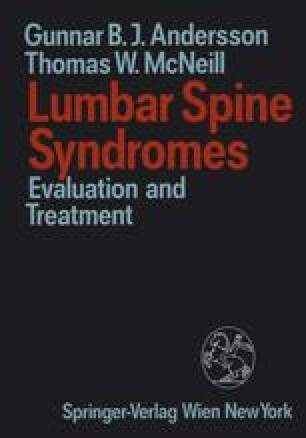 Large recent studies (Spangfort, 1972; Raaf, 1959) indicate that the actual incidence of cauda equina syndrome in patients with disc herniation is low; closer to two percent overall. It is important to recognize that disc herniation is not the only cause of cauda equina syndrome; but, it is by far the most common. Other causes of sacral root neural compression are tumors and infections.